San Diego’s first suburb, Hillcrest, is now a diverse, vibrant retail and residential neighborhood and the heart of San Diego’s LGBT community. Established in 1907 by William Whitson, the suburb was soon connected to downtown by streetcars and was a popular shopping area. The “Hillcrest” lighted sign on University and Fifth avenues was first put up in 1940, but taken down and rebuilt in 1984. 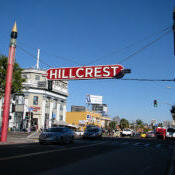 Hillcrest went into decline after World War II, but was revitalized in the 1970s when it became the city’s LGBT center. In 2012, a large rainbow flag was put up at the corner of University Avenue and Normal Street, and Blaine Avenue was changed to Harvey Milk Street. Hillcrest is a bustling business district known for its restaurants and shops, but it also has many medical offices and two hospitals. The neighborhood has a large LGBT population and is popular with urban singles. It has the largest concentration of gay-and lesbian-owned businesses in San Diego. Hillcrest has a population of about 13,000 residents, and is densely populated at 9,700 people per square mile. The median annual household income is $61,537, slightly above the city average. Median age is 41.3 years and the average household size is 1.7 people, far below the San Diego average of 2.8; and the percentage of family households is a low 13.7 percent. About 30 percent of residents have a bachelor’s degree or higher. This historic neighborhood north of downtown has a de facto slogan, “tolerance and acceptance,” as it’s the heart of the city’s LGBT community. The streets are constantly filled with shoppers who browse the trendy boutiques and thrift stores, and people come from miles away to dine at the popular restaurants in the area.